3 R Day… Rock, Roll and Rain! We started a bit late because of the rain. Got out of the camp ground around 8:30 am. 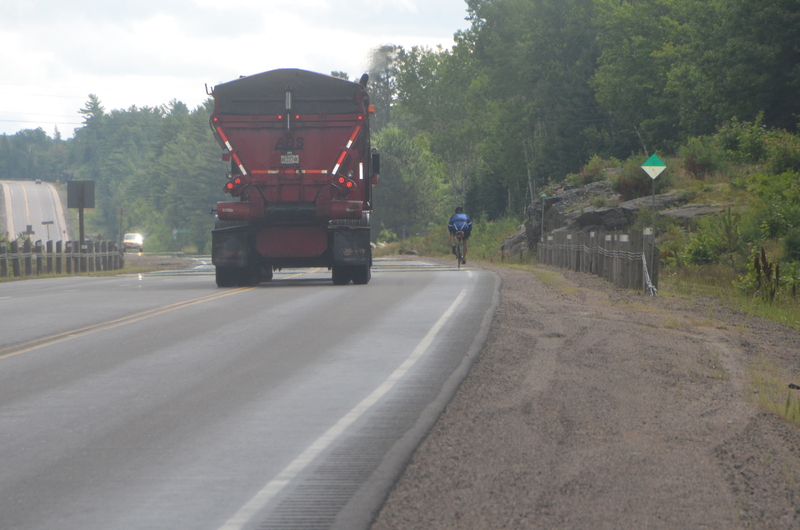 The first 120 km were characterized by the rocks of the Canadian Shield, rolling hills and rain. Soon into our day we hit what someone called the “5 km” hill. There was nothing flat for then next 120 km. Added to this was wave after wave of rain. This shot has the rain, rocks and roll all in one plus a big truck added in for good measure! Notice no shoulder because of the humble strip! Wet shoes were with us all day but everyone had good attitudes. Richard said, “That was a nice shower.” after the first wave of rain. My attitude was not that good! Our goal was reached… Petawawa after about 10 hours on the road. The sun came out for the last hour of our ride and the road flattened out! Our hosts met us at the gates of the Armed Forces Base. Our host Richard and Helen met us at the gates to the Canadian Armed Forces Base and Richard in the blue and yellow, rode the rest of the way to their home with us. They served us one of my favorite summer meals burgers and fresh corn on the cob. We had a great visit with Richard, Helen and their grand daughters. Thank you Richard and Helen! He who began the good work will bring to completion.